Fire fighter Chantelle Pohl sprays the burnt car with assistance from Lt. Ken Akerman (left) and fire fighter Dustin Bean. 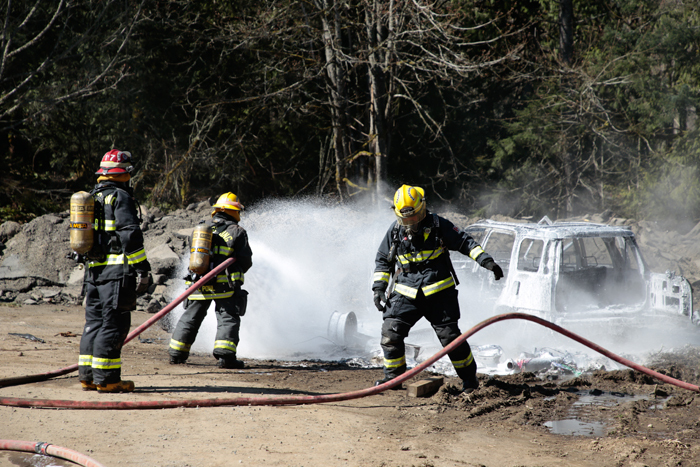 The Salt Spring Island Fire Department responded to a call for a vehicle on fire on Stewart Road on Thursday. The vehicle was being taken apart at the Marcottes’ wrecking yard in the 100 block of Stewart Road at around noon. A mechanic was removing the fuel tank and lines from the vehicle when it sparked and caught fire. BC Ambulance was also on scene, treating one person for burns. Traffic on Stewart Road was down to one lane for part of the afternoon.